A stand in the busy Tshangu district publicizing the sale of motorised tricycles. A great majority of Kinshasa’s 10+ million inhabitants use buses for long commutes on the city’s main thoroughfares. On more minor routes and for shorter trips, people use shared taxis, motorbikes - which are relatively costly for low-income commuters - or walk to get where they are going. Motorised tricycles were identified as a mode of transportation for passengers that is more affordable than shared taxis or motorbikes, but faster than walking, and is little-utilized in Kinshasa. Operators find it difficult to purchase motorised tricycles. To address this, ELAN worked with FINCA to launch a credit product in June specifically designed to facilitate the purchase of motorised tricycles by local businesses and increase their use. ELAN RDC believes that both customers and businesses can benefit financially as a result. 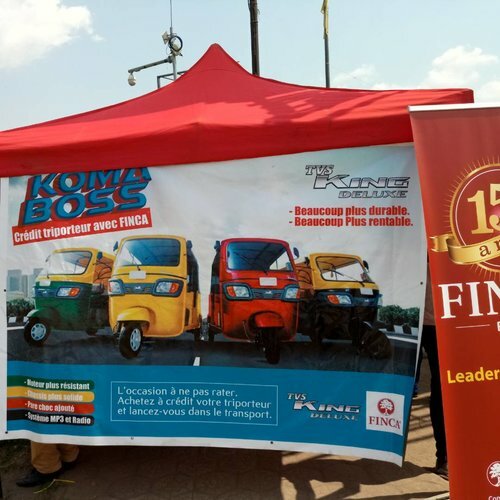 Kinshasa commuters now have another transportation option that is more affordable than a motorbike yet faster than walking. Businesses that operate the motorised tricycles can now more affordably purchase the vehicles and serve a previously under-served segment of the market. And a financial institution has further diversified its offerings by adding a new credit product. While adding a new option to the transportation mix for commuters, ELAN RDC anticipates that at least some operators will use the motorised tricycles to improve the flow of goods throughout the city.